Laptops allow you to take immense computing power with you wherever you go. 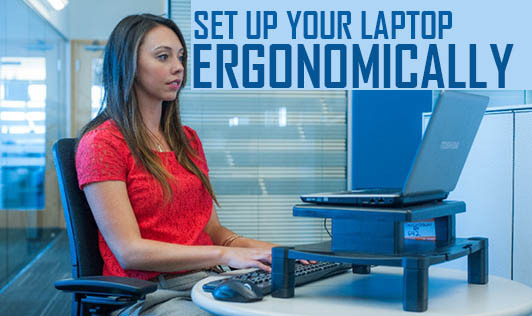 When you work on a laptop for 10-12 or more hours in a day, your posture, your keyboard spacing, screen size and pointing devices need to be ergonomically comfortable. Laptop docking station: It's simply a piece of hardware that stays on your desk while you travel with your laptop. These devices let you plug in your laptop to a base station that has a monitor, keyboard and mouse already connected. Dual keyboards and mouse: Similar to the above, this doesn't have a docking station, but you need to get an ordinary keyboard and mouse and connect them to the laptop. Use only the laptop screen as a monitor, but use the second independent keyboard and mouse for your typing. • Use exercises to ward off Repetitive Strain Injury. Avoid resting your wrists while typing. Keep your wrists as flat as possible. • Schedule mini-breaks every 20 to 30 minutes to avoid repetition and static positions.